Norwex in the Wall Street Journal! "Scientists for years have studied microfibers' ability to remove germs. The findings have prompted hospitals, restaurants and other public places to incorporate them into their cleaning regimens. "A damp microfiber cloth is a really good tool for removing microorganisms, including viruses and bacteria," says Kristen Gibson, a microbiologist at the University of Arkansas who published a study in 2012 comparing the performances of different cleaning cloths without the use of chemical cleaners on food-preparation surfaces. The study, which was funded by the U.S. Department of Agriculture, found that microfiber cloth effectively removed viruses. It also outperformed terry-cloth and nonwoven cloth towels in preventing viruses from being transferred from one surface to another. "There's no reason to use a chemical every time you clean, but there are obviously situations like handling raw meat or someone being sick that would warrant a disinfectant," says Dr. Gibson." "Microfiber cloths, dusters and mop heads require special care to maintain, including thorough rinsing and regular laundering. Norwex, a Norway-based maker of high-end products, says its microfiber threads are embedded with a silver agent that prevents mold, mildew and bacterial odor in the cloth. The company, which sells a $26.99 polishing cloth, suggests users fold its cloths eight times so a fresh cleaning surface is exposed for each task. Laundering the cloths requires gentle detergent and avoiding bleach and dryer sheets so that the microfiber strands aren't damaged. The company also sells a $112.99 mop with interchangeable heads for wet and dry cleaning. Weaning consumers off the notion that fragrance connotes clean is one of the biggest challenges in converting them to chemical-free cleaning, companies say. Norwex, which markets its products through direct sales, trains its consultants to talk about how most scented cleaners are full of chemicals. "Clean doesn't have a smell," says Amy Cadora, Norwex's chief marketing officer." Illinois’ ban becomes the first of its kind in the U.S. and paves the way for other states that are considering legislation, such as Minnesota, Ohio, New York and California. The legislation has a phased rollout starting at the end of 2017, when companies have to stop manufacturing products with synthetic plastic microbeads, and ends in 2019, when over-the-counter drugs must be microbead-free. Some companies are already planning to remove microbeads prior to 2017 and are looking into natural alternatives such as ground seeds or nuts. Thank you, Illinois, for taking important steps toward protecting the Great Lakes and reducing chemicals in our environment! Avoid microbeads in your personal care products - toothpaste, facial scrubs, body washes, etc. Where would you find microbeads? Check your toothpaste, face wash, shower gel, and products specific to exfoliating skin. It is labeled on the ingredients as "microbeads". Want to test it yourself? Squeeze several drops of any product containing microbeads, like Johnson & Johnson Clean and Clear Facial Scrub, into a small jar full of water, then shake it up and filter the foamy mixture through a black T-shirt. The microbeads will be left behind on the fabric - likely hundreds of them - tiny white, pink and blue plastic beads. 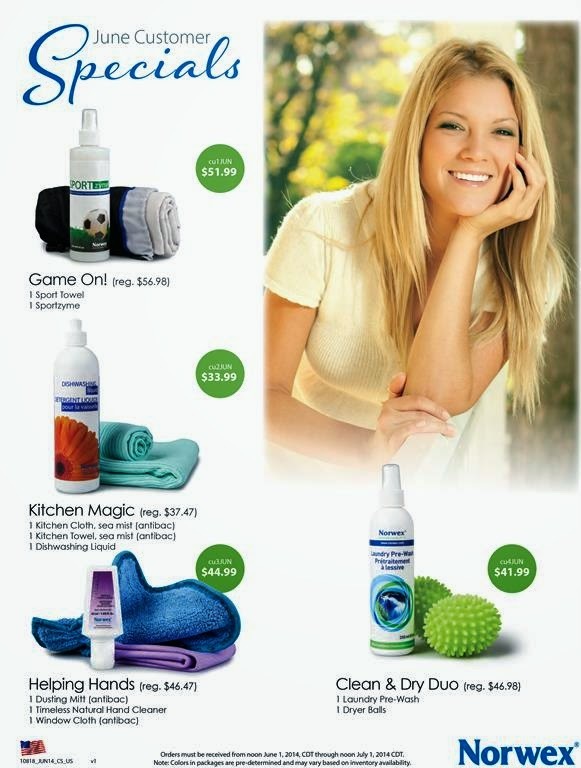 Norwex has a full line of safe, effective, moisturizing skin care products. Simply search "Personal Care" keyword on my blog for more information on personal care products, including our Naturally Timeless line. 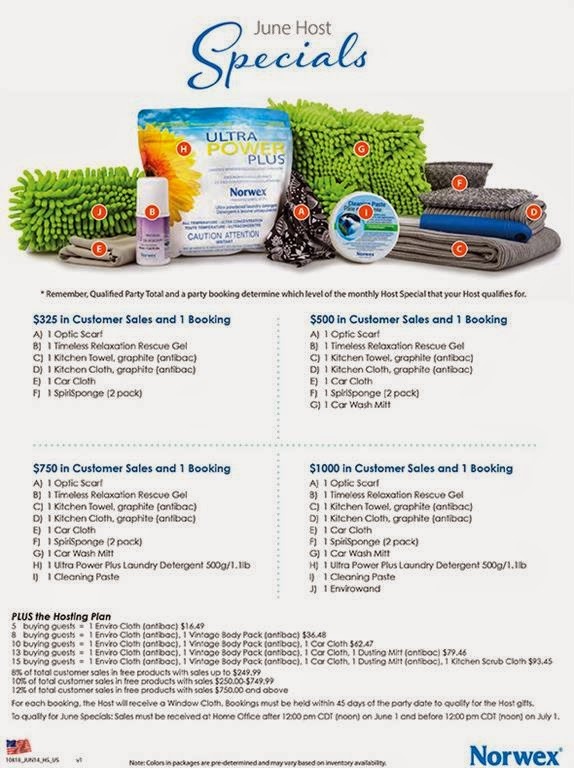 One of the things I love so very much about Norwex is the incredible rewards for inviting a few friends over to learn about greener methods of cleaning your home and reducing toxic chemicals in personal care and cleaning products. Contact me today to take advantage of these deals for June! To qualify for June specials: Sales must be received at Home Office after 12:00 PM CST (noon) on June 1st and before 12:00 PM CST (noon) on July 1st.